In Dragon NaturallySpeaking, the commands Bold That, Underline That, Italicize That, and Format That Bullet Style all share a quirky property: They undo themselves. For example, if you select some regular text and say, “Bold That,” the text becomes bold. But if you select some bold text and say, “Bold That,” it becomes regular. If you say, “Bold That” twice, you wind up back where you started. These commands have something in common: In most word processors, you perform these actions by clicking buttons on a toolbar. The Bold, Italic, Underline, and Bullet buttons on a word processor’s toolbar typically work like the power button on a TV: You push it again to turn the power off. So the designers at Dragon had a decision to make: Should bold, italic, underline, and bullet commands work like typical voice commands or should they work like the toolbar buttons that people are used to using? The designers decided to model the commands after the buttons, and that’s why they undo themselves. In this figure, the “Format That Size 18” command is given. Not all point sizes exist for all font families. If you request a nonexistent point size, your command is ignored. 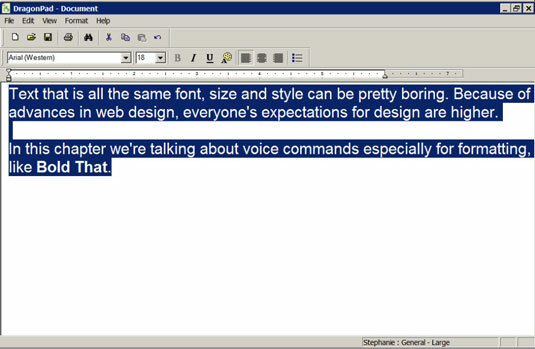 When you begin to dictate, the text appears in the size type that you requested, if that size exists in the current font family.